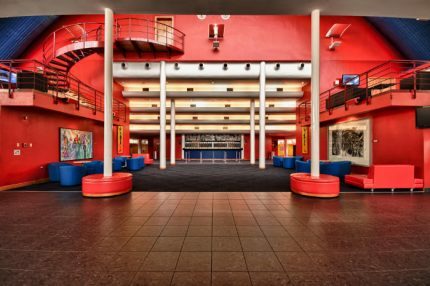 Lobby/Foyer - Queen's Hall. The home of the performing arts community. 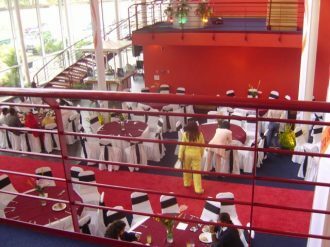 In October 2006 Queen’s Hall Phase Two Redevelopment Project received the Penta Award at the Caribbean Building Awards for Excellence for the best interior. That will come as no surprise to your guests when they enter the Hall. With soaring ceilings and a glassed-in façade, our Lobby offers a spectacular feeling of light and space that is enhanced by a vibrant colour palette and the paintings of Jackie Hinkson, Nigel Paris and Liz Gardener. 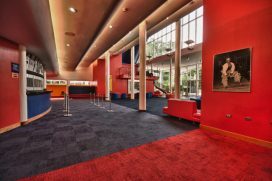 The Lobby is an ideal location for media events and poetry readings, film screenings, lectures and cocktails functions. 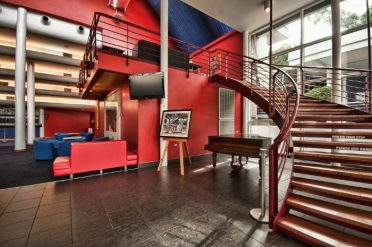 With a seating capacity of 150-175, the Lobby can provide an ideal setting for your entertainment and conference needs.